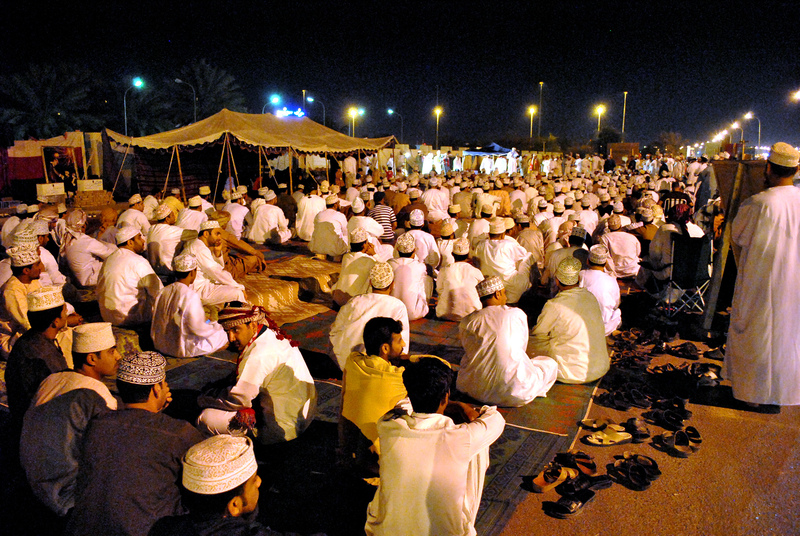 Sit-in at Majlis ash-shura in Muscat March 4th. Photo by writer. After 40 days and 40 nights in Oman, I decided to attend the sit-in taking place in front of the Majlis ash-Shura (Consultative Council) here in Muscat. People have been coming for a few weeks now, and even the lack of an official response from their leader, Sultan Qaboos, has failed to hinder the steady increase in protesters. I fully expected to share the experience with members of the international media, or at least with some Omani journalists, but none could be found on either night I attended. That would explain the immediate attention I drew upon my arrival there; people surrounded me and asked me who I worked for, and what I was doing there. The mood was extremely peaceful, as over 500 Omanis from all walks of life voiced their concerns over how their beloved country was run. A constitution is also highly important for Omanis, she added, as it would ensure a separation of powers that does not yet exist. She scoffed at the minister reshuffling that took place last week, and likened it to a game of chess. Sultan Qaboo’s latest move put some legislative and auditing power into the hands of the state council, which used to serve solely as advisers. The feeling is clear; people adore the Sultan and recognize his achievements for Oman, often referring to him as “father” – but they are fed up with the rampant corruption exercised by various ministers. Basma is part of an ad-hoc committee that was supposed to fly to Salalah, a city in southern Oman where more than 20,000 people gathered last night in an impromptu show of solidarity. She was to be joined by Mohamed al-Harthy, an Omani writer and poet I also spoke with, who had once been imprisoned for over a month due to comments made about the Sultan. Their plan is to ensure co-ordination between the cities, and to gather all the demands before submitting them to the Sultan at a later date. Clearly, these feelings have resonated within Omanis for quite some time now, but strict laws preventing gatherings and freedom of expression have impeded their ability to be heard. Omani newspapers continue to emphasize the pro-Sultan rallies, rather than focusing on the sit-ins, which are anything but anti-Sultan. Contrarily to other Arab revolts, the leader here is adored, the demands are straightforward and reasonable, and there is no sectarian split to fuel violence. In fact, with the exception of the sporadic clashes in Sohar, demonstrations around Oman have been peaceful and well-organized. A week ago, an anonymous Arabic text message was sent to my phone in the middle of the night. It claimed the riots in Sohar had been incited by “paid foreigners and spies from the United Arab Emirates.” A spy row between these neighbours has severely strained relations, but mediation by Kuwaiti leader Sheikh Sabah al-Ahmad al-Sabah seems to have cooled off both parties. Al-Harthy explained to me that many Omanis living near the UAE border work there, which would explain the high ratio of UAE license plates in Sohar, and the reason why Omani Intelligence would try to lay blame on UAE nationals for the violence. At the time of writing this article at the beginning of March, a new anti-corruption task force has just been established by the Sultan, and four ministers have been let go. Clearly, Omani voices are being heard, as proven by the timely decrees issued by the Sultan during the past few weeks. Myles Dolphin is a recent Concordia graduate in English literature and Arabic culture. He is currently teaching English as a second language in the Middle East, in order to improve his Arabic and to get a feel for the region. He moved to Muscat, the capital of Oman, in January to teach at an international school and plans on being there indefinitely.